In the 12 months ended Nov. '13, the federal budget deficit was $615 billion. 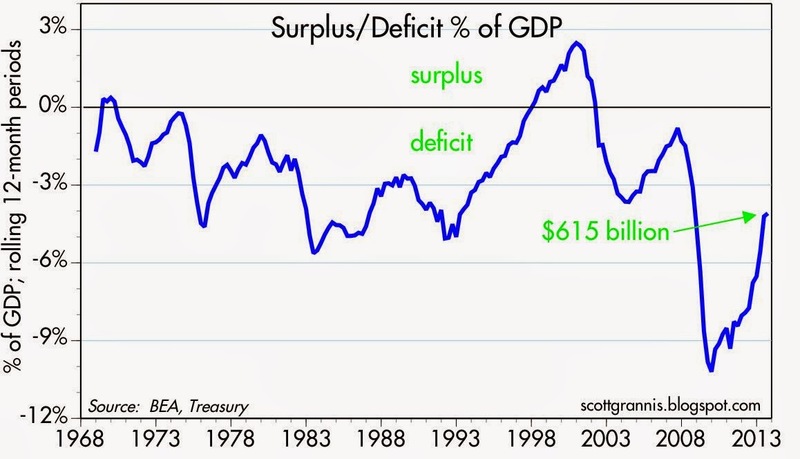 The last time we saw a deficit that low was 5 years ago. It has dropped $862 billion from its all-time high of $1.48 trillion in Feb. '10. As a % of GDP, the budget deficit this year will be a mere 3.6%, down radically from the its 2010 high of 10.2%. This dramatic improvement far exceeds anything that wild-eyed optimists might have predicted 4-5 years ago. Most of the credit (about 60%) goes to spending restraint: this year federal spending will be about $3.43 trillion, which is the same as was spent in the 12 months ended June 2009. That will mark four and a half years of zero increase in federal spending. 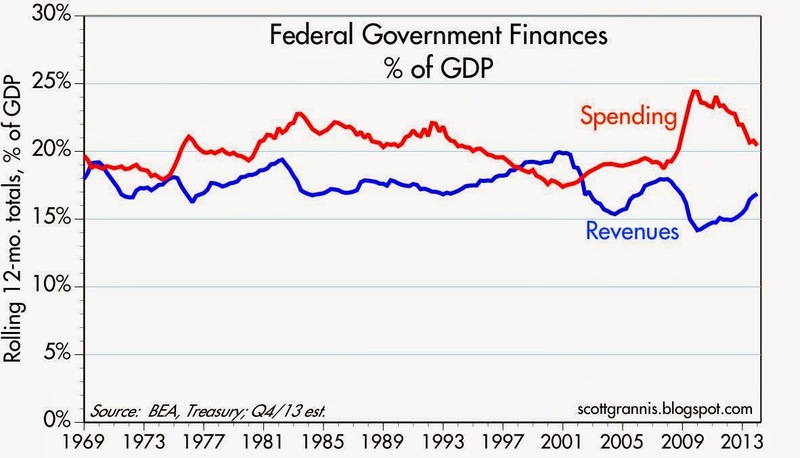 As a % of GDP, federal spending this year will be 20.4% of GDP, down from its 2009 high of 24.4%. The other 40% of the reduction in the deficit comes from increased tax revenues, which in turn came mostly from an increase in the tax base (i.e., more people working, higher incomes, increased capital gains realizations, and higher corporate profits). As a % of GDP, tax revenues this year will be about 16.9% of GDP, up almost 20% from the low of 14.2% in 2009. We didn't need higher tax rates to boost revenues, we just needed a growing economy. This is BIG news. The shrinking size of government (relative to the economy) means that expected future tax burdens have declined significantly. This lifts a heavy burden from the shoulders of the economy, and paves the way for stronger economic growth in the years to come. 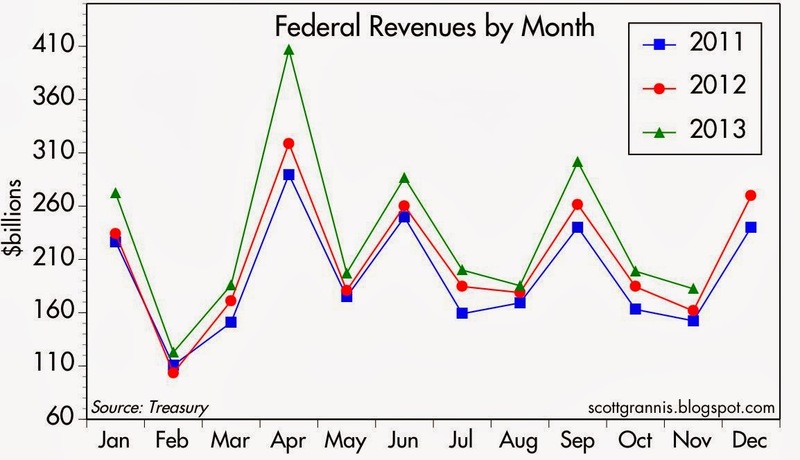 This improvement has nothing to do with the surge in tax receipts in the final months of 2012, when income and capital gains realizations were accelerated in order to beat the higher expected tax rates of 2013. 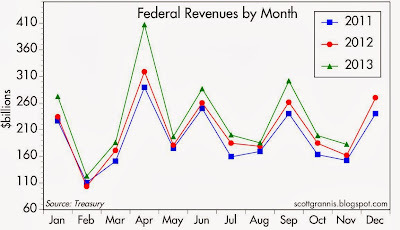 As the chart above shows, monthly revenues have been noticeably higher than their year-ago levels in almost every month for the past three years. This is ongoing improvement that should continue. Given all this unexpectedly great news, the need for and the justification for higher tax rates has all but vanished. Moreover, we now know that Keynesian theory—which holds that a huge reduction in the budget deficit and a huge decline in spending relative to the economy would be terrible news for the economy—is completely wrong. The past 5 years have proven to be a very expensive but very valuable lesson in how to deal with out of control budget deficits. The formula is simple: hold the line on spending, let the economy grow, and avoid raising taxes if at all possible. We could do better going forward if we not only keep spending growth very low but also reduce tax rates. Four years ago it seemed impossible that we would ever see the budget numbers that we are seeing today. Looking ahead, it's not impossible at all that things could improve even more. In two months the deficit is at 1/4 of a trillion dollars! FBS balance sheet about to go bust? With all the good economic news, how come no one in America is feeling the love...? My only complaint about this post is that Scott Grannis does not call for outright cuts in federal outlays and then tax cost. Do we need a federal Department of Education? The USDA? Commerce? Labor? Cato Institute says we can cut military outlays by half. Why not implement such a plan in stages? Can we raise the the retirement age on Social Security? How about no federal pensions for anybody, including the military, until age 68? There are lot of ways to bring federal spending down to 15 percent of GDP, and then cut taxes! The "good" news is only temporal. Excellent post, Ben Jamin! You forgot the worst of all federal nanny departments - the EPA. Close out SS as well, since it is only a poverty pension program. 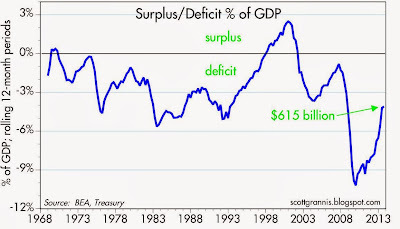 Mark my words, the federal deficit will again begin to deteriorate, as the Beltway Repubcos are incapable to make serous spending reductions. We need a decade of blood, sweat and tears.. I can't figure out if this post is parody. It what world with 2% inflation and 13% U-6 is decreasing the income of the private sector through a reduction in the Govt deficit a good thing? Only in a world (Keynesian) where government spending has a multiplier greater than 1. In the real world, government deficits don't create money, they only redistribute it. They don't increase income. Government invariably spends money less efficiently than the private sector, so the spending multiplier is <1 or even negative. With government now redistributing less, this leaves the private sector with more, and strengthens the overall economy. ah yes, the fantasy of the neo-liberals. 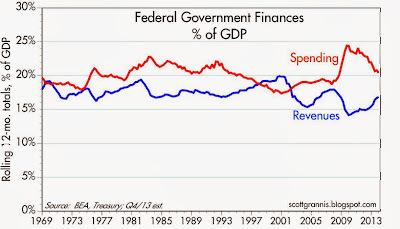 Govt deficit spending is adding new financial wealth to the economy. This is beyond dispute, all you need to do isthe very simple accounting. And that last 1000 entry is the net addition, accoutning 101. 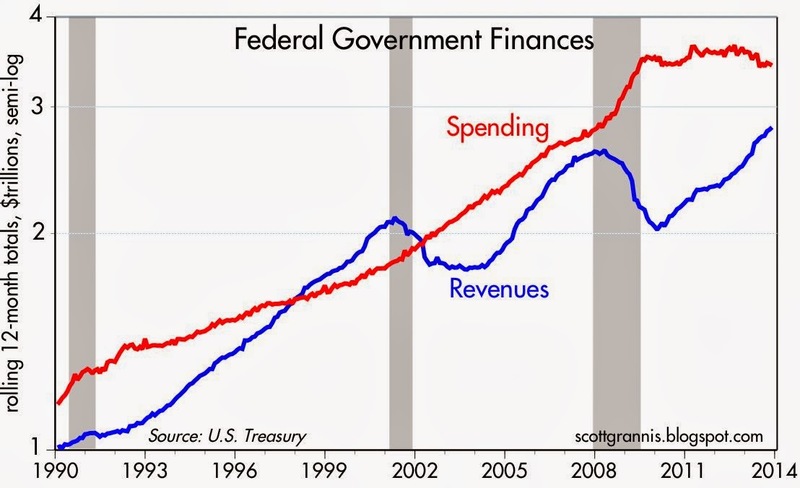 Yes, taxes and spending do redistribute money, deficit spending is essentially financial wealth printing. IF the GOvt suspended FICA, allowing the american public to keep more than $1 trillion of our money, would that be helpful to the private economy? The answer is of course yes. "deficit spending recipient's bank' reserve account +1000"
Since the TGA goes up and down 1000 its impact on the accounting is neutral. The increased 1000 liability that would go into the T-security column is with the Govt and not the private sector, hence the term Net financial asset. According to the latest data from the Bureau of Economic Analysis, the federal deficit is actually 5.06% of GDP. This is great because it means that the awesome bull market still has many years remaining. Good luck breaking through decades of misinformation, political motives, and household finance analogies. Keep up the the fight.